Drizzle cubed pears with lemon juice. 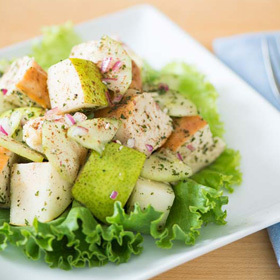 In large mixing bowl, combine pears, chicken, cucumber and onion. Set aside. Blend vinegar, lemon juice, honey, mint, and salt and pepper in food processor or blender until smooth. Drizzle dressing over fruit and chicken mixture, and toss gently to coat. To serve, retoss gently, sprinkle with cinnamon and arrange on plates with beds of lettuce. Serving size: 1/4 of recipe. Amount per serving: 231 calories, 3g total fat (less than 1g saturated fat), 31g carbohydrates, 23g protein, 5g dietary fiber, 131mg sodium.